Hilda was looking for Pink Wedding Invitations for her wedding to Vincent. 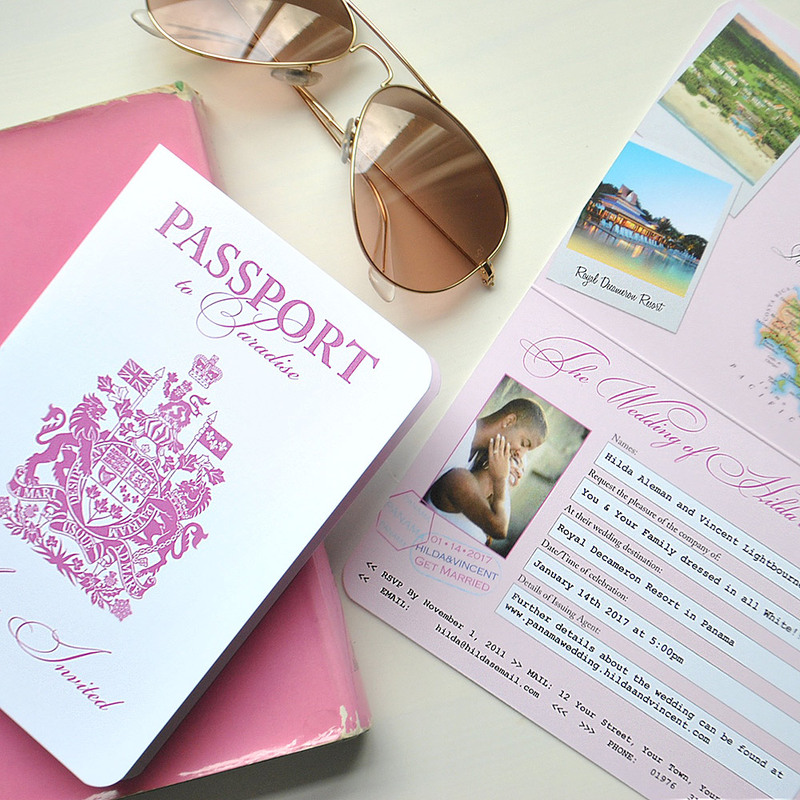 They had a beautiful pink and white theme in mind for their wedding and wanted a passport invitation to reflect this. The outside of the invite was white with a deep rose pink for the passport crest, wording and monogram. The inside was a pale pink with some wording picked out in the same darker pink from the front cover. Although they are from Bermuda and are getting married in Panama after seeing a number of different passport covers Hilda and Vincent chose to use the Canadian crest for their invitation. I think Hilda's exact words were "it has more pizzazz" and I have to agree as I think it's my favourite passport cover too, lucky Canadians! I included two shots of the Royal Decameron Resort in Panama, her beautiful wedding location, to show guests a glimpse of what to expect on the big day. Hilda also chose to include a colour map of Panama on the inside front cover. Hilda and Vincent decided not to have their guests names printed onto the invitation and rather than have a space to write out names they chose to include the wording "You and Your Family" in that section. I'm finding more and more couples opting for something similar and addressing the envelope to those invited rather than having their names on the actual invitation. Formal wedding etiquette might disagree with me here but I don't see the harm and it will either save you the time and effort of handwriting in your guests name or the additional cost of having them printed on your invite. "We must say we are blown away by the way our beautiful pink wedding invitations turned out, absolutely magnificent! Kate was a pleasure to work with and after giving her a simple overview of what we were looking for we then asked her to add her own creative touch and she did just that. We are totally happy with Kate's work and the final product. And YES we will use her again!" Get in touch by clicking on a box below - Order a sample (the cost is refunded if you place an order so what's stopping you? ), Get a Quote - All costs are included in a quote from us, design work to make your stationery unique, high quality envelopes for mailing out and next day shipping - there are no hidden charges to worry about when you order from Destination Stationery!